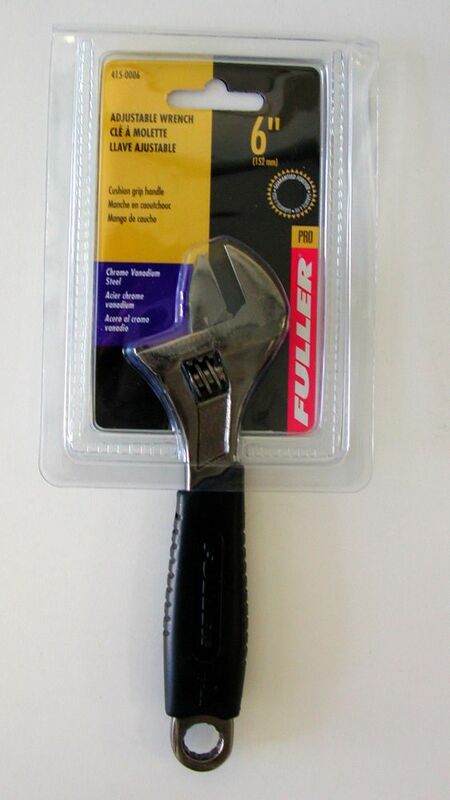 From its lightweight chrome-vanadium steel construction to its close-fitting adjustments, this 6-inch adjustable wrench has everything a professional wants: a slim profile head for working in cramped quarters, a cushion-grip handle for comfort and ease of use, a non-sticking adjustment mechanism that turns smoothly, and precision-machined jaws for a close fit every time. Without the right tools, the list of to-do tasks at home can seem daunting. That's why when it comes to tackling your home repair or improvement projects, you'll want this 5-piece offset ratcheting box wrench set in your toolbox. Made from chrome-vanadium steel for long life, and plated in chrome to resist corrosion and grime, this set includes 5 ratcheting double-ended wrenches and 10 standard metric box-end sizes. The handy two-way ratcheting action makes tightening or loosening bolts faster and easier than with standard box end wrenches. What's more, the angled head means no more bruised or cut-up knuckles because it provides greater clearance. Sometimes a big job requires a big, sturdy tool. For those times when you need extra torque and gripping power, this 24-inch pipe wrench is the answer: drop forged alloy steel makes this tool strong enough to endure heavy-duty use, while the hardened precision-milled teeth stubbornly grip almost any rounded surface. Designed with professional tradesmen in mind, this quality pipe wrench offers solid value for the money. Pro Series 6-inch Adjustable Wrench with Slim-Profile Head From its lightweight chrome-vanadium steel construction to its close-fitting adjustments, this 6-inch adjustable wrench has everything a professional wants: a slim profile head for working in cramped quarters, a cushion-grip handle for comfort and ease of use, a non-sticking adjustment mechanism that turns smoothly, and precision-machined jaws for a close fit every time.